There seem to be a renewed interest among French painters for painting “sur le motif”. 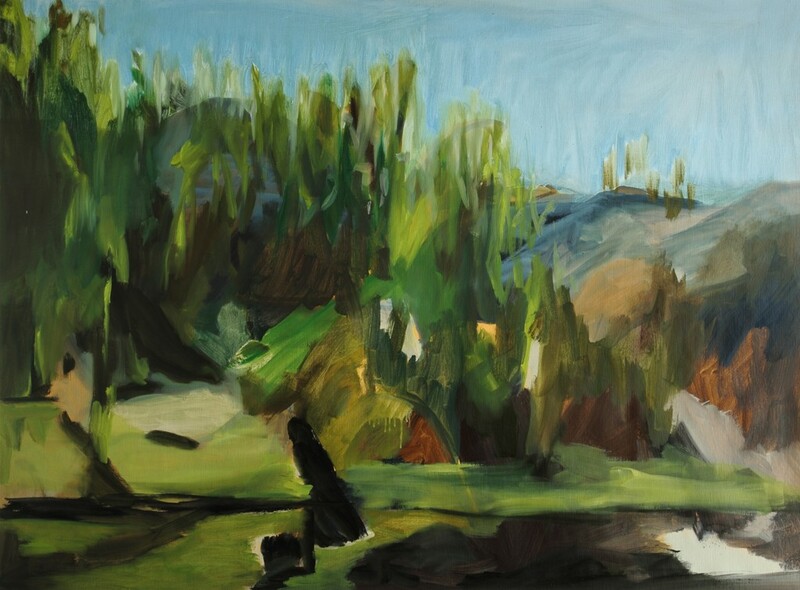 And if I lived in the beautiful mountains that lie between Lyon and Switzerland (and knew how to paint), I would certainly do as Claire Chauvel : take my paint brushes, my canvas, my oil tubes and easel, find an inspiring spot, and paint in plein air. The technique has a venerable history, even before its heyday with the Impressionists. But with them, technique finally espoused content : they wanted to refresh their eyes with scenes not yet constructed into “landscapes”, to perceive sensations directly and more keenly, as they tried to catch a fleeting impression before it vanished, to study natural light and its effect on the landscape, on the figure, to find new colors and compositions in the fields that surrounded Paris and La Marne. With only one day to capture their vision of the changing landscape, they promoted what were merely ” preliminary studies” to the status of finished works, and in so doing, redefined painting as a process of transformation of the sensations of the world into paint. Many of these concerns have been passed on to contemporary plein air painters, and Claire Chauvel sounds very close to my favorite books on Impressionism when she explains why she has chosen this approach : she speaks of the colors she discovered in nature – the brightness, the effects of distance, the fascination of greens. 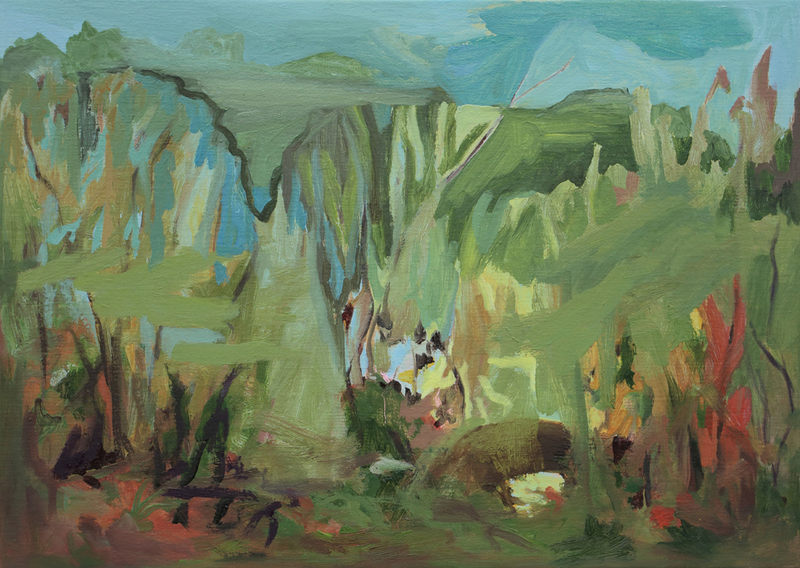 She is not the first painter I meet for whom green is magic – green caught here between luminous blue and earthly reds, a new palette that appeared in her work when she first discovered the region during an artist’s residency. She immediately fell in love, soon moved there, and abandoned the emulation of the Paris art world to find inspiration in the land. It is the density of this presence that draws you in. 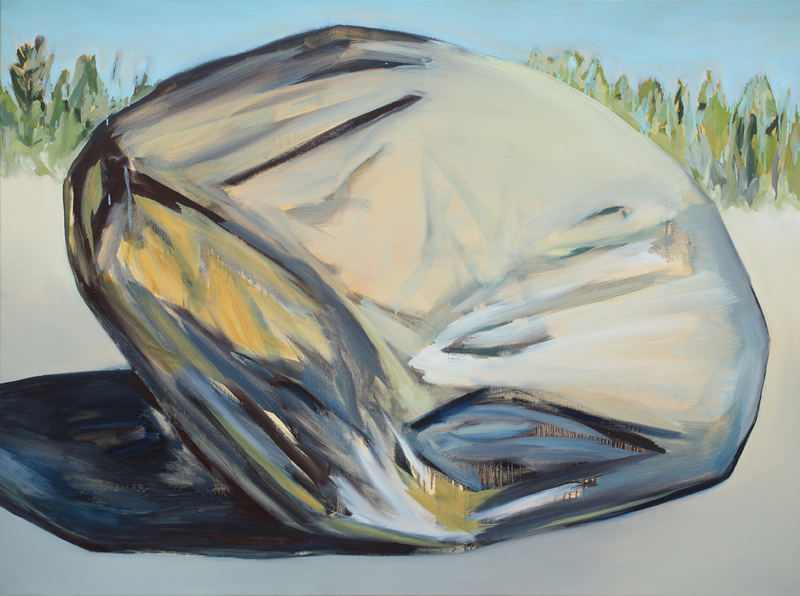 When you look at Claire Chauvel’s paintings, you oscillate between several ways of looking : you try exploring the mystery of a partially hidden landscape – and you lose yourself in a full surface, a suggestion of vast space condensed in several planes, the absence of clue that makes scale ambiguous, openings that lead nowhere and force the gaze to return incessantly to the front of the picture. You try projecting yourself to the horizon, in the distance, but the horizon is too high – it turns back upon you, it looks threatening and stifling. I like this ambiguity. The idea that something remains hidden and inaccessible”. 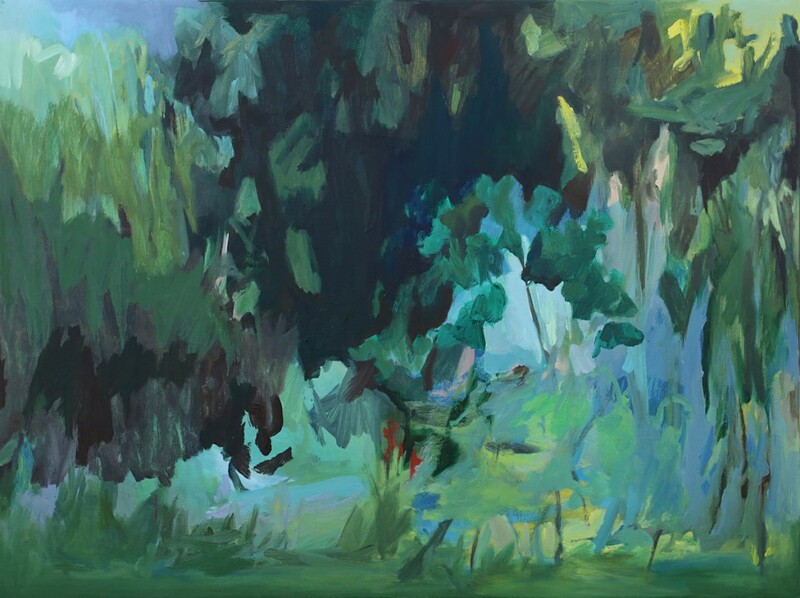 But in this partly indecipherable space, there are blocks of paints, paint brush traces, tangles of colors – and then, forgetting the landscape you start looking at the painter’s hidden presence – the joy of painting expressed in lavish colors, tree movements imitated by swirls, tangles, and scribbles, the distance by shade. The more abstract compositions are pure rhythm. It is when we speak of her practice that she starts revealing what she strives to achieve. She describes the artist’s struggle with oil that dries slowly while the day’s light changes too fast. A few of her paintings are finished outside, in one session, but often, she continues working in the studio. Faithfulness doesn’t matter once the landscape has been transformed into a convincing composition. As l look again at the paintings, I realize once more how much each of these paintings invites the viewer to look slowly, to take time to navigate between planes, decipher details, imagine what’s hidden. And so I leave you to dream with a night image, one of a series that disappeared from the artist’s website. Lives and works in Ain. 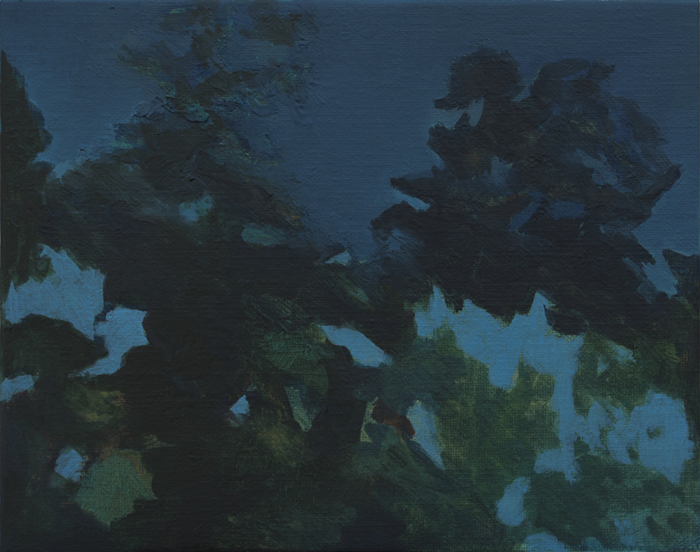 Claire Chauvel is currently exhibiting Trees and Rocks at the Mapra, Lyon through February 27, 2016.